It feels more official now that my business cards have arrived! 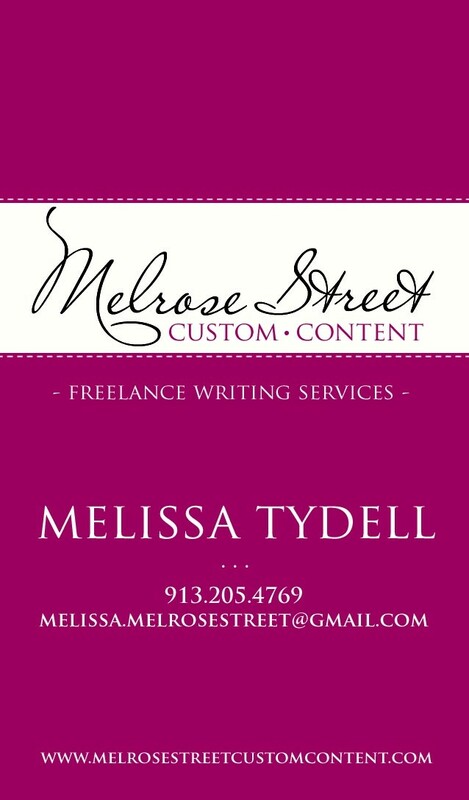 With this new tool, I can get the word out about Melrose Street Custom Content and spread my contact information further. Since I am excited to pass along the cards, I thought it was only appropriate to also share them with you all. 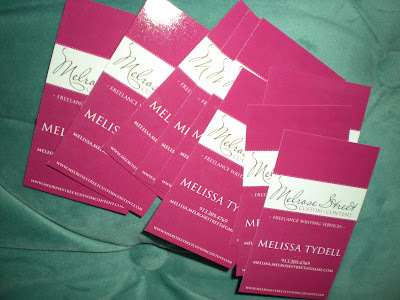 The fabulous logo and business card design are the creation of Megan Ibarra of Little Yellow Leaf. 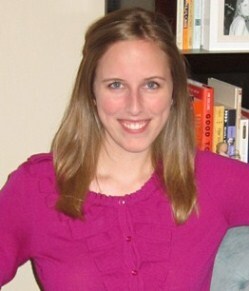 (You may remember when I profiled her paper/invitation company in this post about female small business owners.) Megan did a wonderful job of taking my thoughts and sources of inspiration, crafting a couple different design options and then tweaking them with my feedback and suggestions. Despite all the tiny changes I requested to see, Megan worked with me patiently every step of the way. Each time she came back with new versions that incorporated just what I was envisioning. With her fresh design, creative ideas and endless enthusiasm, it was a fun process... and really tough to make a decision on the final logo and business card design! I am so pleased with the finished product. Based on Megan's recommendation, I printed the cards via UV Cards. The company offers quality printed pieces and does a good job of keeping customers posted on each step of the production and shipping process. I can vouch for their ongoing communication based on my own experience. And if UV Cards has concerns about the uploaded file and possible printing issues, they offer suggestions to modify the file. I also had an opportunity to view the proof and approve via email before the cards were printed. 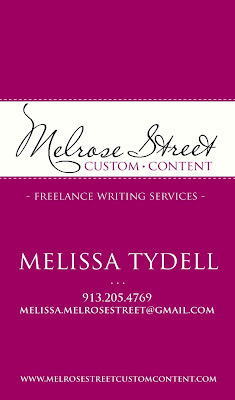 So without further adieu, here is a look at my Melrose Street Custom Content business card. Hope you like it! Your cards look great! Good look spreading the word!